The post discusses work validating multiple cancer variant callers in bcbio-nextgen using a synthetic reference call set from the ICGC-TCGA DREAM challenge. We’ve previously validated germline variant calling methods, but cancer calling is additionally challenging. Tumor samples have mixed cellularity due to contaminating normal sample, and consist of multiple sub-clones with different somatic variations. Low-frequency sub-clonal variations can be critical to understand disease progression but are more difficult to detect with high sensitivity and precision. Publicly available whole genome truth sets like the NA12878 Genome in a Bottle reference materials don’t currently exist for cancer calling, but other groups have been working to prepare standards for use in evaluating callers. The DREAM challenge provides a set of synthetic datasets that include cellularity and multiple sub-clones. There is also on ongoing DREAM contest with real, non-simulated data. In addition, the ICGC has done extensive work on assessing the challenges in cancer variant calling and produced a detailed comparison of multiple variant calling pipelines. Finally, Bina recently released a simulation framework called varsim that they used to compare multiple callers as part of their cancer benchmarking. I’m excited about all this community benchmarking and hope this work can contribute to the goal of having fully consented real patient reference materials, leading to a good understanding of variant caller tradeoffs. In this work, we evaluated cancer tumor/normal variant calling with synthetic dataset 3 from the DREAM challenge, using multiple approaches to detect SNPs, indels and structural variants. A majority voting ensemble approach combines inputs from multiple callers into a final callset with good sensitivity and precision. We also provide a prioritization method to enrich for somatic mutations in tumor samples without matched normals. Miika Ahdesmaki and Justin Johnson at AstraZeneca collaborated with our group on integrating and evaluating multiple variant callers. Their financial support helped fund our time on this comparison, and their scientific contributions improved SNP and indel calling. Luca Beltrame integrated a number of cancer variant callers into bcbio and wrote the initial framework for somatic calling. Lorena Pantano integrated variant callers and performed benchmarking work. Members of our group, the Harvard Chan school Bioinformatics core, regularly contribute to bcbio development and validation work. The Wolfson Wohl Cancer Research Centre supported our work on validation of somatic callers. James Cuff, Paul Edmon and the team at Harvard FAS research computing provided compute infrastructure and support that enabled the large number of benchmarking runs it takes to get good quality calling. I’m continually grateful to the community for all the contributions and support. The MuTect commit history for bcbio is a great example of multiple distributed collaborators working towards the shared goal of integrating and validating a caller. MuTect (1.1.5) – A SNP only caller, built on GATK UnifiedGenotyper, from the Broad Institute. MuTect requires a license if used for commercial purposes. VarDict (2014-12-15) – A SNP and indel caller from Zhongwu Lai and the oncology team at AstraZeneca. FreeBayes (0.9.20-1) – A haplotype aware realigning caller for SNPs and indels from Erik Garrison and Gabor Marth’s lab. VarScan (2.3.7) – A heuristic/statistic based somatic SNP and indel caller from Dan Koboldt and The Genome Institute at Washington University. Scalpel (0.3.1) – Micro-assembly based Indel caller from Giuseppe Narzisi and the Schatz lab. We pair Scalpel with MuTect to provide a complete set of small variant calls. LUMPY (0.2.7) – A probabilistic structural variant caller incorporating both split read and read pair discordance, developed by Ryan Layer in Aaron Quinlan and Ira Hall’s labs. DELLY (0.6.1) – An integrated paired-end and split-end structural variant caller developed by Tobias Rausch. WHAM (1.5.1) – A structural variant caller that can incorporate association testing, from Zev Kronenberg in Mark Yandell’s lab at the University of Utah. bcbio runs these callers and uses simple ensemble methods to combine small variants (SNPs, indels) and structural variants into final combined callsets. The new small variant ensemble method uses a simplified majority rule classifier that picks variants to pass based on being present in a configurable number of samples. This performs well and is faster than the previous implementation that made use of both this approach and a subsequent support vector machine step. 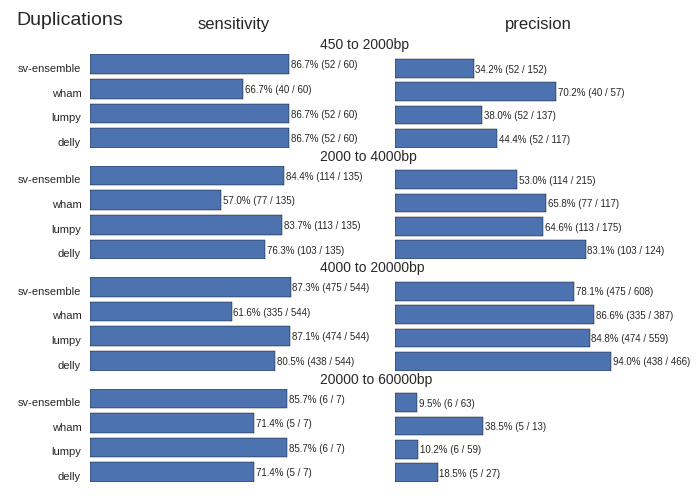 Using the 100x whole genome tumor/normal pair from DREAM synthetic dataset 3 we evaluated each of the callers for sensitivity and precision on small variants (SNPs and indels). This synthetic dataset contains 100% tumor cellularity with 3 subclones at allele frequencies of 50%, 33% and 20%. In addition to the whole genome results, the validation album includes results from running against the same dataset limited to exome regions. This has identical patterns of sensitivity and precision. It runs quicker, so is useful for evaluating changes to filtering or program parameters. The full album of validation results includes the comparisons for deletion and inversion events. These comparisons measure the contributions of individual callers within an ensemble approach that attempts to maximize sensitivity and specificity for the combined callset. Keep in mind that each of the individual results make use of other caller information in filtering. Our goal is to create the best possible combined calls, rather than a platform for unbiased comparison of structural variant callers. We’re also actively working on improving sensitivity and specificity for individual callers and expect the numbers to continue to evolve. For example, Zev Kronenberg added WHAM’s ability to identify different classes of structural changes, and we’re still in the process of improving the classifier. Our evaluation comparisons show best effort attempts to provide good quality calls for every caller. The final results often come from multiple rounds of improving sensitivity and precision by adjusting program parameters or downstream filtering. The goal of tightly integrating bcbio with validation is that the community can work on defining a set of parameters and filters that work best in multiple cases, and then use these directly within the same framework for processing real data. The original implementation used a vcfsamplediff based approach to filtering, as recommended on the FreeBayes mailing list. The current, improved, version uses a custom filter based on genotype likelihoods, based on the approach in the speeseq pipeline. In general, you can find all of the integration work for individual callers in the bcbio source code, broken down by caller. For instance, here is the integration work on MuTect. The goal is to make all of the configuration settings and filters fully transparent so users can understand how they work when using bcbio, or transplant them into their own custom pipelines. The above validations were all done on cancer calling with tumor and normal pairs. The filters to separate pre-existing germline mutations from cancer specific somatic mutations rely on the presence of a normal sample. In some cases, we don’t have matched normal samples to do this filtering. Two common examples are FFPE samples and tumor cell lines. For these samples, we’d like to be able to prioritize likely tumor specific variations for followup using publicly available resources. We implemented a prioritization strategy from tumor-only samples in bcbio that takes advantage of publicly available resources like COSMIC, ClinVar, 1000 genomes, ESP and ExAC. It uses GEMINI to annotate the initial tumor-only VCF calls with external annotations, then extracts these to prioritize variants with high or medium predicted impact, not present in 1000 genomes or ExAC at more than 1% in any subpopulation, or identified as pathenogenic in COSMIC or ClinVar. Validating this prioritization strategy requires real tumor samples with known mutations. Our synthetic datasets are not useful here, since the variants do not necessarily model standard biological variability. You could spike in biologically relevant mutations, as done in the VarSim cancer simulated data, but this will bias towards our prioritization approach since both would use the same set of necessarily imperfect known variants and population level mutations. We took the approach of using published tumor data with validated mutations. Andreas Sjödin identified a Hepatoblastoma exome sequencing paper with publicly available sample data and 23 validated cancer related variations across 5 samples. This is a baseline to help determine how stringent to be in removing potential germline variants. We consistently missed one confirmed mutation in the HB2T sample. This variant, reported as a somatic mutation in an uncharacterized open reading frame (C2orf57), may actually be a germline mutation in the study sub-population. The variant is present at a 10% frequency in the East Asian population but only 2% in the overall population, based on data from both the ExAC and 1000 genomes projects. Although the ethnicity of the original samples is not reported, the study authors are all from China. This helps demonstrate the effectiveness of large population frequencies, stratified by population, in prioritizing and evaluating variant calls. The major challenge with tumor-only prioritization approaches is that you can’t expect to accurately filter private germline mutations that you won’t find in genome-wide catalogs. With a sample set using a small number of validated variants it’s hard to estimate the proportion of ‘additional’ variants in the table above that are germline false positives versus the proportion that are additional tumor-only mutations not specifically evaluated in the study. We plan to continue to refine filtering with additional validated datasets to help improve this discrimination. Practically, bcbio automatically runs prioritization with all tumor-only analyses. It filters variants by adding a “LowPriority“ filter to the output VCF so users can readily identify variants flagged during the prioritization. Informing variant calling using estimates of tumor purity and sub-clonal frequency. bcbio integrates CNVkit, a copy number caller, which exports read count segmentation data. Tools like THetA2, phyloWGS, PyLOH and sciClone use these inputs to estimate normal contamination and sub-clonal frequencies. Focusing on difficult to call genomic regions and provide additional mechanisms to better resolve and improve caller accuracy in these regions. Using small variant calls to define problematic genome areas with large structural rearrangements can help prioritize and target the use of more computationally expensive methods for copy number assessment, structural variant calling and de-novo assembly. Evaluating calling and tumor-only prioritization on Horizon reference standards. They contain a larger set of validated mutations at a variety of frequencies. As always, we welcome suggestions, contributions and feedback. This post describes community based work integrating structural variant calling and validation into bcbio-nextgen. I’ve previously written about approaches for validating single nucleotide changes (SNPs) and small insertions/deletions (Indels), but it has always been unfortunate to not have reliable ways to detect larger structural variations: deletions, duplications, inversions, translocations and other disruptive events. Detecting these events with short read sequencing is difficult, and our goal in bcbio is to create a global summary of predicted structural variants from multiple callers alongside measures of sensitivity and precision. LUMPY – a probabilistic structural variant caller incorporating both split read and read pair discordance, developed by Ryan Layer in Aaron Quinlan and Ira Hall’s labs. DELLY – an integrated paired-end and split-end structural variant caller developed by Tobias Rausch. cn.mops – a read count based copy number variation (CNV) caller developed by Günter Klambauer. bcbio integrates structural variation predictions from all approaches into a high level BED file. This is a first pass way to identify potentially disruptive large scale events. Here are example regions: a duplication called by all 3 callers, a deletion called by 2 callers, and a complex region with both deletions and duplications. This output associates larger structural events with regions of interest in a high level way, while allowing us to quickly determine the individual tool support for each event. Using this, we are no longer blind to potential structural changes and can use the summary to target in-depth investigation with the more detailed metrics available from each caller and a read viewer like PyBamView. The results can also help inform prioritization of SNP and Indel calls since structural rearrangements often associate with false positives. Longer term we hope this structural variant summary and comparison work will be useful for community validation efforts like the Global Alliance for Genomics and Health benchmarking group, the Genome in a Bottle consortium and the ICGC-TCGA DREAM Mutation Calling challenge. Below I’ll describe a full evaluation of the sensitivity and precision of this combined approach using an NA12878 trio, as well as describe how to run and extend this work using bcbio-nextgen. This blog post is the culmination of a lot of work and support from the open source bioinformatics community. David Jenkins worked with our our group for the summer and headed up evaluation of structural variation results. We received wonderful support from Colby Chang, Ryan Layer, Ira Hall and Aaron Quinlan on both LUMPY and structural variation validation in general. They freely shared scripts and datasets for evaluation, which gave us the materials to make these comparisons. Günter Klambauer gave us great practical advice on using cn.mops. Tobias Rausch helped immensely with tips for speeding up DELLY on whole genomes, and Ashok Ragavendran from Mike Talkowski’s lab generously discussed tricks for scaling DELLY runs. Harvard Research Computing provided critical support and compute for this analysis as part of a collaboration with Intel. To validate the output of this combined structural variant calling approach we used a set of over 4000 validated deletions made available by Ryan Layer as part of the LUMPY manuscript. These are deletion calls in NA12878 with secondary support evidence from Moleculo and PacBio datasets. We further subset these regions by removing calls in low complexity regions identified in Heng Li’s variant calling artifacts paper. An alternative set of problematic regions are the potential misassembly regions identified by Colby Chang and Ira Hall during LUMPY and speedseq development (Edit: The original post mistakenly mentioned these overlap significantly with low complexity regions, but that is only due to overlap in obvious problem areas like the N gap regions. We’ll need additional work to incorporate both regions into future evaluations. Thanks to Colby for catching this error.). These are a useful proxy for regions we’re currently not able to reliably call structural variants in. We ran all structural variant callers using the NA12878/NA12891/NA12892 trio from the CEPH 1463 Pedigree as an input dataset. This consists of 50x whole genome reads from Illumina’s platinum genomes project, and is the same dataset used in our previous analyses of population based SNP and small indel calling. Our goal is to define boundaries on sensitivity – the percentage of validated calls we detect – and precision – how many of the total calls overlap with validated regions. We required a simple overlap of the called regions with validated regions to consider a called variant as validated, and stratified results by event size to quantify detection metrics at different size ranges. Across all size classes, we detect approximately half of the structural variants and expect that about half of the called events are false positives. Smaller structural variants of less than 1kb are the most difficult to detect with these methods. Larger events from 1kb to 25kb have better sensitivity and precision. As the size of the events increase precision decreases, so larger called events tend to have more false positives. Beyond the values for sensitivity and precision, the biggest takeaway is that combining multiple callers helps detect additional variants we’d miss with any individual caller. Count based callers like cn.mops enable improved sensitivity on large deletions but don’t resolve small deletions at 50x depth using our current settings, although tuning can help detect these smaller sized events as well. Similarly, lumpy and delly capture different sets of variants across all of the size classes. The comparison also emphasizes the potential for improving both individual caller filtering and ensemble structural variant preparation. The ensemble method uses bedtools to create a merged superset of all individually called regions. This is the simplest possible approach to combine calls. Similarly, individual caller filters are intentionally simple as well. cn.mops calling performs no additional filtering beyond the defaults, and could use adjustment to detect and filter smaller events. Our DELLY filter requires 4 supporting reads or both split and paired read evidence. Our LUMPY filter require at least 4 supporting reads to retain an event. We welcome discussion of the costs and tradeoffs of these approaches. For instance, requiring split and paired evidence for DELLY increases precision at the cost of sensitivity. These filters are a useful starting point and resolution, but we hope to continue to refine and improve them over time. bcbio-nextgen handles installation and automation of the programs used in this comparison. The documentation contains instructions to download the data and run the NA12878 trio calling and validation. This input configuration file should be easily adjusted to run on your data of interest. The current implementation has reasonable run times for whole genome structural variant calling. We use samblaster to perform duplicate marking alongside identification of discordant and split read pairs. The aligned reads from bwa stream directly into samblaster, adding minimal processing time to the run. For LUMPY calling, the pre-prepared split and discordant reads feed directly into speedseq, which nicely automates the process of running LUMPY. For DELLY, we subsample correct pairs in the input BAM to 50 million reads and combine with the pre-extracted problematic pairs to improve runtimes for whole genome inputs. We processed three concurrently called 50x whole genome samples from FASTQ reads to validated structural variants in approximately 3 days using 32 cores. Following the preparation work described above, LUMPY calling took 6 hours, DELLY takes 24 hours parallelized on 32 cores and cn.mops took 16 hours parallelized by chromosome on 16 cores. This is a single data point for current capabilities, and is an area where we hope to continue to improve scalability and parallelization. The implementation and validation are fully integrated into the community developed bcbio-nextgen project and we hope to expand this work to incorporate additional structural variant callers like Pindel and CNVkit, as well as improving filtering and ensemble calling. We also want to expand structural variant validation to include tumor/normal cancer samples and targeted sequencing. We welcome contributions and suggestions on current and future directions in structural variant calling. Michael Linderman and colleagues describe approaches for validating clinical exome and whole genome sequencing results. One key result I took from the paper was the difference in assessment between exome and whole genome callsets. Coverage differences due to capture characterize discordant exome variants, while complex genome regions drive whole genome discordants. Reading this paper pushed us to evaluate whole genome population based variant calling, which is now feasible due to improvements in bcbio-nextgen scalability. Heng Li identified variant calling artifacts and proposed filtering approaches to remove them, as well as characterizing caller error rates. We’ll investigate two of the filters he proposed: removing variants in low complexity regions, and filtering high depth variants. 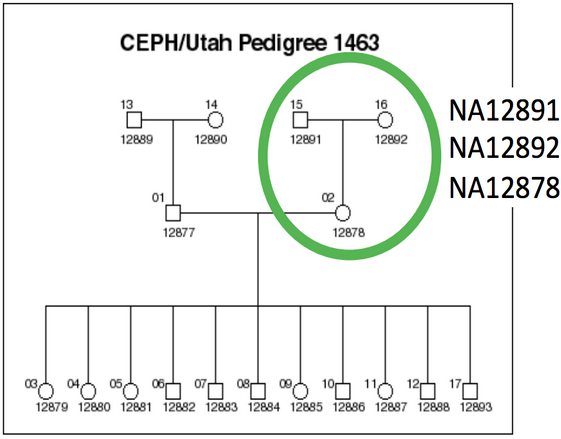 We use the NA12878/NA12891/NA12892 trio from the CEPH 1463 Pedigree as an input dataset, consisting of 50x whole genome reads from Illumina’s platinum genomes. This enables both whole genome comparisons, as well as pooled family calling that replicates best-practice for calling within populations. We aligned reads using bwa-mem and performed streaming de-duplication detection with samblaster. Combined with no recalibration or realignment based on our previous assessment, this enabled fully streamed preparation of BAM files from input fastq reads. We called variants using two realigning callers: FreeBayes (v0.9.14-7) and GATK HaplotypeCaller (3.1-1-g07a4bf8) and evaluated calls using the Genome in a Bottle reference callset for NA12878 (v0.2-NIST-RTG). The bcbio-nextgen documentation has full instructions for reproducing the analysis. Low complexity regions contribute 45% of the indels in whole genome evaluations, and are highly variable between callers. This replicates Heng’s results and Michael’s assessment of common errors in whole genome samples, and indicates we need to specifically identify and assess the 2% of the genome labeled as low complexity. Practically, we’ll exclude them from further evaluations to avoid non-representative bias, and suggest removing or flagging them when producing whole genome variant calls. We add a filter for removing false positives from FreeBayes calls in high depth, low quality regions. This removes variants in high depth regions that are likely due to copy number or other larger structural events, and replicates Heng’s filtering results. We improved settings for GATK variant quality recalibration (VQSR). The default VQSR settings are conservative for SNPs and need adjustment to be compatible with the sensitivity available through FreeBayes or GATK using hard filters. Low complexity regions (LCRs) consist of locally repetitive sections of the genome. Heng’s paper identified these using mdust and provides a BED file of LCRs covering 2% of the genome. Repeats in these regions can lead to artifacts in sequencing and variant calling. Heng’s paper provides examples of areas where a full de-novo assembly correctly resolves the underlying structure, while local reassembly variant callers do not. To assess the impact of low complexity regions on variant calling, we compared calls from FreeBayes and GATK HaplotypeCaller to the Genome in a Bottle reference callset with and without low complexity regions included. The graph below shows concordant non-reference variant calls alongside discordant calls in three categories: missing discordants are potential false negatives, extras are potential false positives, and shared are variants that overlap between the evaluation and reference callsets but differ due to zygosity (heterozygote versus homozygote) or indel representation. 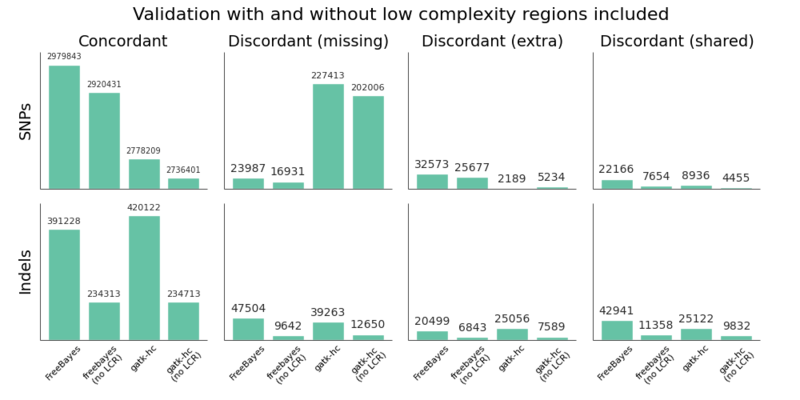 For SNPs, removing low complexity regions removes approximately ~2% of the total calls for both FreeBayes and GATK. This corresponds to the 2% of the genome subtracted by removing LCRs. For indels, removing LCRs removes 45% of the calls due to the over-representation of indels in repeat regions. Additionally, this results in approximately equal GATK and FreeBayes concordant indels after LCR removal. Since the Genome in a Bottle reference callset uses GATK HaplotypeCaller to resolve discrepant calls, this change in concordance is likely due to bias towards GATK’s approaches for indel resolution in complex regions. The default GATK VQSR calls for SNPs are not as sensitive, relative to FreeBayes calls. I’ll describe additional work to improve this below. Practically, we’ll now exclude low complexity regions in variant comparisons to avoid potential bias and more accurately represent calls in the remaining non-LCR genome. We’ll additionally flag low complexity indels in non-evaluation callsets as likely to require additional followup. Longer term, we need to incorporate callers specifically designed for repeats like lobSTR to more accurately characterize these regions. The second filter proposed in Heng’s paper was removal of high depth variants. This was a useful change in mindset for me as I’ve primarily thought about removing low quality, low depth variants. However, high depth regions can indicate potential copy number variations or hidden duplicates which result in spurious calls. A nice bonus of this filter is that it makes intuitive sense: variants with high depth and low quality indicate there is something problematic, and depth manages to partially compensate for the underlying issue. 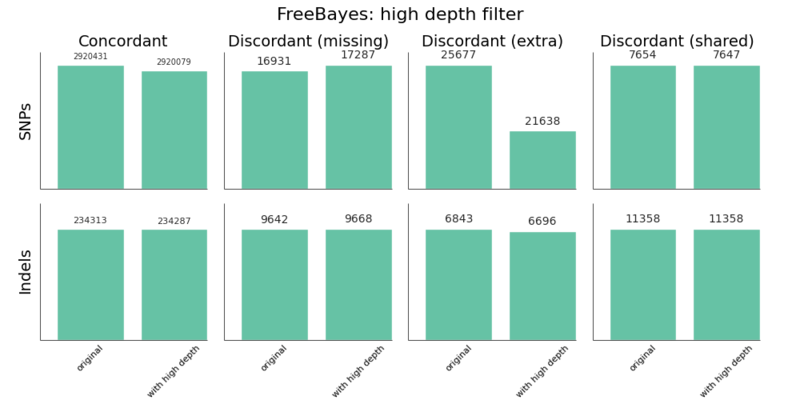 Inspired by GATK’s QualByDepth annotation and default filter of QD < 2.0, we incorporated a generalized version of this into bcbio-nextgen’s FreeBayes filter: QUAL < (depth-cutoff * 2.0) and DP > depth-cutoff. The default setting for VQSR is not a tranche level (like 99.0), but rather a LOD score of 0. In this experiment, that corresponded to a tranche of ~99.0 for SNPs and ~98.0 for indels. The best-practice example documentation uses command line parameter that specify a consistent tranche of 99.0 for both SNPs and indels, so depending on which you follow as a default you’ll get different sensitivities. To increase sensitivity, increase the tranche level. My expectations were that decreasing the tranche level would include more variants, but that actually applies additional filters. My suggestion for understanding tranche levels is that they specify the percentage of variants you want to capture; a tranche of 99.9% captures 99.9% of the true cases in the training set, while 99.0% captures less. We found tranche settings of 99.97% for SNPs and 98.0% for indels correspond to roughly the sensitivity/specificity that you achieve with FreeBayes. These are the new default settings in bcbio-nextgen. Using hard filtering of variants based on GATK recommendations performs well and is also a good default choice. For SNPs, the hard filter defaults are less conservative and more in line with FreeBayes results than VQSR defaults. VQSR has improved specificity at the same sensitivity and has the advantage of being configurable, but will require an extra tuning step. Overall VQSR provides good filtering and the ability to tune sensitivity but requires validation work to select tranche cutoffs that are as sensitive as hard filter defaults, since default values tend to be overly conservative for SNP calling. In the absence of the ability or desire to tune VQSR tranche levels, the GATK hard filters provide a nice default without much of a loss in precision. VCF files for FreeBayes true positive and false positive heterozygote calls, used here to improve filtering via assessment of high depth regions. Heterozygotes make up the majority of false positive calls so take the most work to correctly filter and detect. Shared false positives from FreeBayes and GATK HaplotypeCaller. These are potential missing variants in the Genome in a Bottle reference. Alternatively, they may represent persistent errors found in multiple callers. We plan to continue to explore variant calling improvements in bcbio-nextgen. Our next steps are to use the trio population framework to compared pooled population calling versus the incremental joint discovery approach introduced in GATK 3. We’d also like to compare with single sample calling followed by subsequent squaring off/backfilling to assess the value of concurrent population calling. We welcome suggestions and thoughts on this work and future directions. A separate directory does not give full isolation from system programs and libraries. It’s possible to disrupt processing by unintentionally including other command line programs into your PATH. Additionally it is not easy to recreate a snapshot of the current environment for reproducibility without manual re-installation of specific versions of software. The automated installation script needs to deal with the peculiarities of heterogeneous cluster environments. Different system characteristics can be tricky to anticipate and automate, and lead to more tickets devoted to install problems than we’d like. The goal is to do more science and spend less time dealing with installation woes. Docker lightweight linux containers help solve both of these issues. By isolating tools and software involved in processing, installation is as easy as downloading a pre-built image containing the software. By containerizing the running process, software does not interfere with other installed programs. Docker containers provide the isolation and deployment advantages of Virtual Machines without the associated overhead. Additionally they allow easy export of the full software environment used to run an analysis, improving our ability to reproduce results. This post describes bcbio-nextgen-vm, a wrapper around bcbio-nextgen that runs analyses using pre-created Docker containers. The implementation is feature compatible with bcbio-nextgen but provides improved installation, isolation and reproducibility. I’ll also discuss future work to further improve provenance and traceability of analysis runs with the Arvados platform, and a fun chance to work on reproducibility and provenance at an Arvados hackathon on Tuesday March 11th. We reused the existing bcbio-nextgen installation scripts to create easily distributed Docker images with pipeline code and external tools. In fact, the bcbio-nextgen Dockerfile replicates current best practice recommendations for setting up the pipeline on a local system. CloudBioLinux drives installation of the software, using packaging work from existing communities such as Bio-Linux, DebianMed and homebrew-science. The advantage over the previous installation approach is that this Docker installation takes place in a defined environment and we distribute the pre-built images, avoiding the need to configure and build software on individual systems. The pre-built Docker image contains a full manifest of installed software, from the system libraries to custom scientific packages. Coupled with the ability to export and save Docker images, this creates a reproducible run environment. Special thanks for the manifest implementation are due to the DebianMed community and Tony Travis. I had time to finish the manifest implementation while at the DebianMed Hackathon in Aberdeen. This critical component helped enable external version queries for Docker isolated software. Tying all these parts together, the bcbio-nextgen-vm wrapper drives processing of individual run components using isolated Docker containers. The Python wrapper script uses the existing work in bcbio-nextgen for defining workflows, and it runs on distributed cluster systems using the IPython parallel framework. Using Conda and Binstar to handle installation of Python dependencies results in a streamlined installation procedure for all the wrapper software. The diagram below shows the parts of bcbio-nextgen handled within each of the components of the system. bcbio-nextgen-vm drives the workflow and parallel runs, interacting with a cluster scheduler, and lives outside of Docker on a central server. The wrapper code manages the work of starting Docker containers and mounting external filesystems to local mounts within the Docker container. On each processing node, execution happens within isolated Docker containers with external biological software and bcbio-nextgen processing-specific code. The initial v0.1.0 release of bcbio-nextgen-vm contains full support for all bcbio-nextgen functionality using isolated Docker containers. It runs on clusters using IPython parallel and on single machines using multiple cores, and has minimal external requirements beyond Docker. See the full installation instructions, and bcbio-nextgen-vm run instructions to get started with processing your samples. It uses the same infrastructure and input files as bcbio-nextgen, so the bcbio-nextgen documentation contains much more detail on defining the biological pipelines to run. With the new isolated framework, you can install bcbio-nextgen on a system with only Docker installed. Conda handles installation of the Python dependencies, ideally inside of an isolated minimal Anaconda Python environment, and is the only non-Docker-contained infrastructure required. The install script will also download and prepare biological data required for processing, including genomes, index files and annotations. We’re hoping to migrate bcbio-nextgen to this Docker enabled framework over time and welcome feedback on installation or usage challenges that still exist. Reporting problems on the GitHub issue tracker would be a major help as we continue to develop and improve the wrapper framework. One area of particular interest is installation and security on cluster systems. While patiently waiting for the ability to run Docker as a non-root user, we recommend installing bcbio-nextgen-vm to run with the docker group id on execution. The internal scripts within the bcbio-nextgen Docker container run all commands as the calling user to mitigate security issues. Adding Docker isolated containers provides the pipeline with improved reproducibility. Maintaining the full state of all the tools and software only requires exporting and gzipping the Docker image and storing it alongside the final processed result. The 1Gb stored image can be later reconstituted and rerun to reproduce earlier results, or shared with collaborators to ensure identical processing pipelines across multiple locations. Saving the initial input data plus the Docker image provides the ability to re-run an analysis at any point in the future. With this framework in place, the next step for improving reproducibility is enabling full provenance to trace processing steps. bcbio-nextgen currently has extensive log files of command lines and program output, but in parallel environments it requires work to deconvolute these to establish the full set of steps leading up to production of files of interest. Arvados is an promising open source framework designed to help handle provenance and run tracking. Curoverse provides commercial support and development for the Arvados platform and recently closed a round of financing as they continue to expand and develop the framework. If you’re interested in reproducibility and provenance, and live in the Boston area, Curoverse is hosting an Arvados hackathon next Tuesday evening, March 11th at their offices. I’ll be there learning about ways to integrate bcbio-nextgen with the work they’re doing and would be happy to talk with anyone about the Docker work or reproducible pipelines in general. I previously discussed our approach for evaluating variant detection methods using a highly confident set of reference calls provided by NIST’s Genome in a Bottle consortium for the NA12878 human HapMap genome, In this post, I’ll update those conclusions based on recent improvements in GATK and FreeBayes. The comparisons use bcbio-nextgen, an automated open-source pipeline for variant calling and evaluation that identifies concordant and discordant variants with the XPrize validation protocol. By having an automated validation workflow attached to a regularly updated, community developed, variant calling pipeline, we can actively track progress of variant callers and provide updates as algorithms improve. Since the initial post, There have been two new GATK releases of UnifiedGenotyper and HaplotypeCaller, as well as multiple improvements to FreeBayes. Additionally we’ve enchanced our ensemble calling method, which combines inputs from multiple callers into a single final set of calls, to better handle comparisons with inputs from three callers. 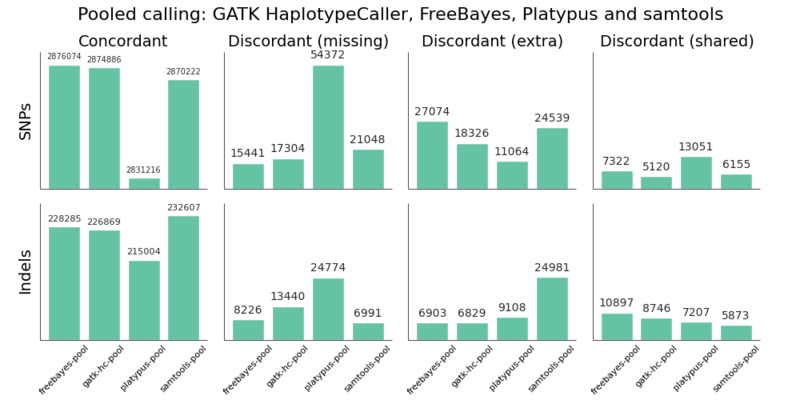 FreeBayes detects more concordant SNPs and indels compared to GATK approaches, including GATK’s HaplotypeCaller method. Post-alignment BAM processing steps like base quality recalibration and realignment have little impact on the quality of variant calls with variant callers that perform local realignment, including FreeBayes and GATK HaplotypeCaller. The Ensemble calling method provides the best variant detection by combining inputs from GATK UnifiedGenotyper, HaplotypeCaller and FreeBayes. Avoiding the post-alignment BAM recalibration and realignment steps allows us to save significant time and pipeline complexity. Combined with the improvements in FreeBayes, this enables a variant calling pipeline that can be freely used for academic, clinical and commercial work with equal quality variant calls compared to current GATK best-practice approaches. GATK’s best practices (2.7-2): This involves de-duplication with Picard MarkDuplicates, GATK base quality score recalibration and GATK realignment around indels. Minimal post-processing, with de-duplication using samtools rmdup and no realignment or recalibration. FreeBayes (v0.9.9.2-18): A haplotype-based Bayesian caller from the Marth Lab. We filter calls with a hard filter based on depth, quality and strand bias. GATK UnifiedGenotyper (2.7-2): GATK’s widely used Bayesian caller. Since this is single sample exome data, we filter calls using GATK’s recommended hard filters, instead of Variant Quality Score Recalibration (VQSR). GATK HaplotypeCaller (2.7-2): GATK’s more recently developed haplotype caller which provides local assembly around variant regions. We also filtered these calls using recommended hard filters. Extra variants, called in the evaluation data but not in the reference. These are potential false positives or missing calls from the reference materials. Missing variants, found in the NA12878 reference but not in the evaluation data set. These are potential false negatives. Shared variants, called in both the evaluation and reference but differently represented. This results from allele differences, such as heterozygote versus homozygote calls, or variant identification differences, such as indel start and end coordinates. FreeBayes outperforms the GATK callers on both SNP and indel calling. The most recent versions of FreeBayes have improved sensitivity and specificity which puts them on par with GATK HaplotypeCaller. 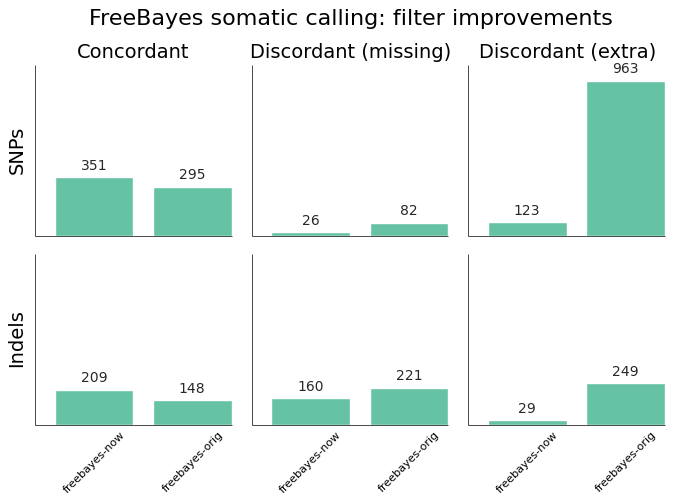 One area where FreeBayes performs better is in correctly resolving heterozygote/homozygote calls, reflected in the lower number of discordant shared variants. GATK HaplotypeCaller is all around better than the UnifiedGenotyper. In the previous comparison, we found UnifiedGenotyper performed better on SNPs and HaplotypeCaller better on indels, but the recent improvements in GATK 2.7 have resolved the difference in SNP calling. If using a GATK pipeline, UnifiedGenotyper lags behind the realigning callers in resolving indels, and I’d recommend using HaplotypeCaller. This mirrors the GATK team’s current recommendations. The ensemble calling approach provides the best overall resolution of both SNPs and indels. The one area where it lags slightly behind is in identification of homozygote/heterozygote calls, especially in indels. This is due to positions where HaplotypeCaller and FreeBayes both call variants but differ on whether it is a heterozygote or homozygote, reflected as higher discordant shared counts. In addition to calling sensitivity and specificity, an additional factor to consider is the required processing time. Rough benchmarks on family-based calling of whole genome sequencing data indicate that HaplotypeCaller is roughly 7x slower than UnifiedGenotyper and FreeBayes is 2x slower. On multiple 30x whole genome samples, our experience is that calling can range from 10 hours for GATK UnifiedGenotyper to 70 hours for HaplotypeCallers. 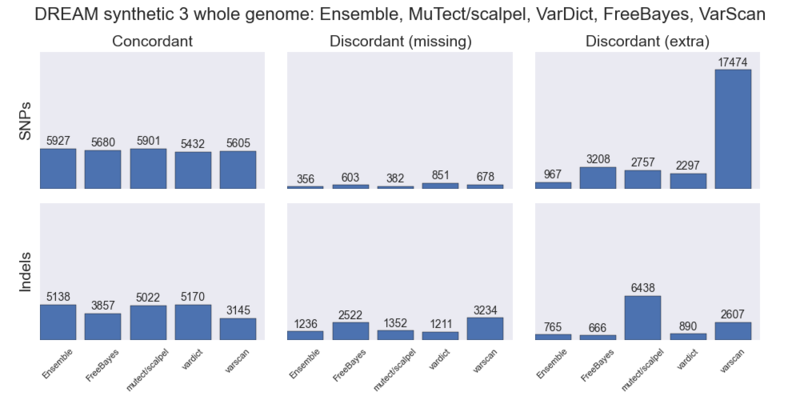 Ensemble calling requires running all three callers plus combining into a final call set, and for family-based whole genome samples can add another 100 hours of processing time. These estimates fluctuate greatly depending on the compute infrastructure and presence of longer difficult genomic regions with deeper coverage, but give some estimates of timing considerations. 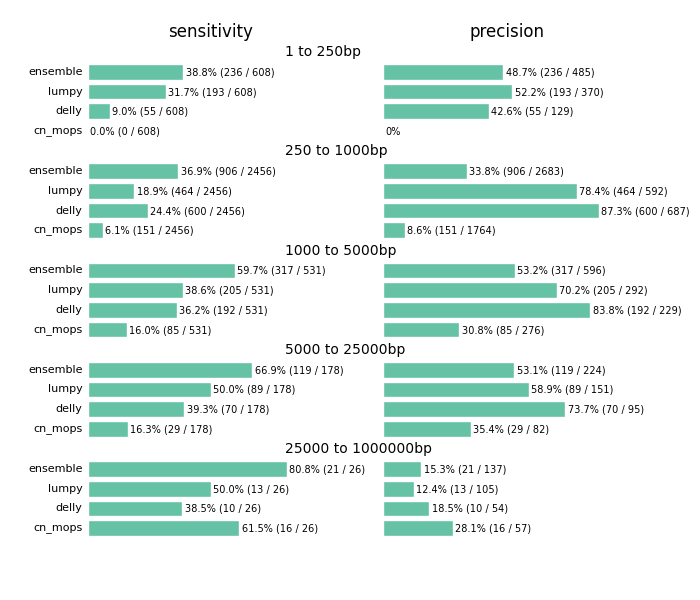 Given the improved accuracy of local realignment haplotype-based callers like FreeBayes and HaplotypeCaller, we explored the accuracy cost of removing the post-alignment BAM processing steps. The recommended GATK best-practice is to follow up alignment with identification of duplicate reads, followed by base quality score recalibration and realignment around indels. Based on whole genome benchmarking work, these steps can take as long as the initial alignment and scale poorly due to the high IO costs of manipulating large BAM files. For multiple 30x whole genome samples running on 16 cores per sample, this can account for 12 to 16 hours of processing time. 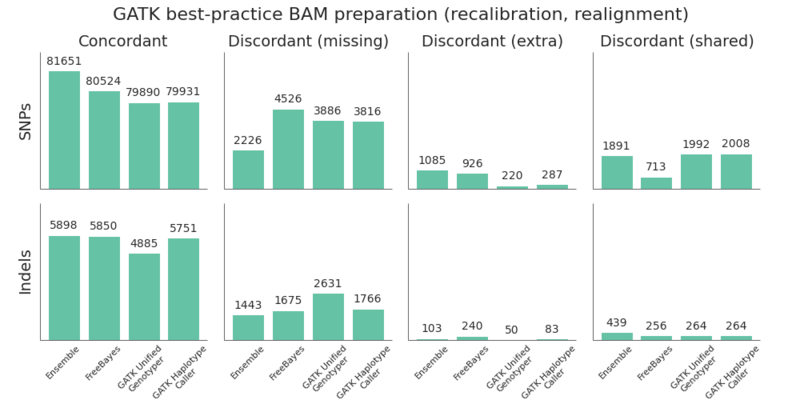 To compare the quality impact of avoiding recalibration and realignment, we performed the identical alignment and variant calling steps as above, but did minimal post-alignment BAM preparation. Following alignment, the only step performed was deduplication using samtools rmdup. Unlike Picard MarkDuplicates, samtools rmdup handles piped streaming input to avoid IO penalties. This is at the cost of not handling some edge cases. Longer term, we’d like to explore biobambam’s markduplicates2, which implements a more efficient streaming version of the Picard MarkDuplicates algorithm. 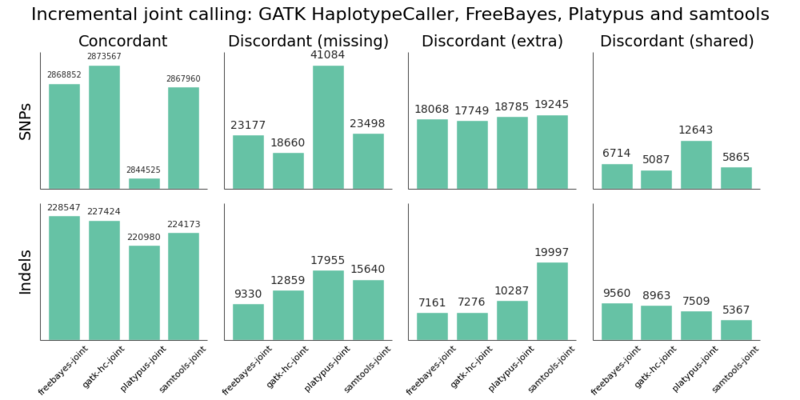 While GATK UnifiedGenotyper suffers during indel calling without recalibration and realignment, both HaplotypeCaller and FreeBayes perform as good or better without these steps. This allows us to save on processing time and complexity without sacrificing call quality when using a haplotype aware realigning caller. Taken together, the improvements in FreeBayes and ability to avoid post-alignment BAM processing allow use of a commercially unrestricted GATK-free pipeline with equal quality to current GATK best practices. Adding in GATK’s two callers plus our ensemble combining method provides the most accurate overall calls, at the cost of additional processing time. It’s also important to consider potential drawbacks of this analysis as we continue to design future evaluations. The comparison is in exome regions for single sample variant calling. In future work it would be helpful to have population or family based inputs. We’d also like to prepare test datasets that focus specifically on evaluating the quality of calls in more difficult repetitive regions within the whole genome. Using populations or whole genomes would also allow use of GATK’s Variant Quality Score Recalibration as part of the pipeline, which could provide improved filtering compared to the hard-filtering approach used here. Another consideration is that the reference callset prepared by the Genome in a Bottle consortium makes extensive use of GATK tools during preparation. Evaluation of the reference materials with FreeBayes and other callers can help reduce potential GATK-specific biases when continuing to develop reliable reference materials. All of these pipelines are freely available, open-source, community developed projects and we welcome feedback and contributors. By integrating validation into a scalable analysis pipeline, we hope to build a community interested in widely accessible calling pipelines coupled with well-evaluated reference datasets and methods.